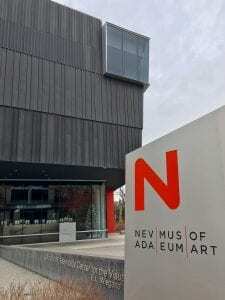 Reno’s Nevada Museum of Art, home of the Center for Art + Environment. Thanks to Bill Fox, this week I’m at the Center for Art + Environment, doing some research for future projects. This institution, housed within the Nevada Museum of Art is a phenomenal resource for anyone making or studying land art; environmental photography or sculpture; aerial imaging; Burning Man… It feels like home! Also, it’s a nice shift to visit Reno under overcast skies and an early-winter snow.